WELCOME TO MY MONEY MISSION ONLINE: TIME FOR A GIVEAWAY....YAY!! The air is getting cooler, the days are starting to get shorter, school is back in session and that means lots and lots of band-related "stuff" going on. So, to minimize the "what to make for dinner" stress, my crockpot is becoming a very useful part of my mealtime planning. Do you love to crockpot?? 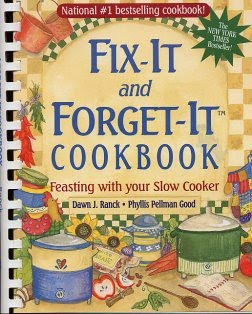 I LOVE IT, so that is why this giveaway is for a plastic spiral bound copy of the National #1 bestselling cookbook, "FIX-IT and FORGET-IT COOKBOOK/Feasting with your Slow Cooker," by Dawn J. Ranck and Phyllis Pellman Good. Just to let you know beforehand, this is not a new copy....I snagged this online through the Goodwill store on ebay. (I like to shop there, because this is a great organization that provides needed jobs and steady income for the disabled). Anyway, it is very gently used but has no marks on the pages or on the covers. It has plenty of life left in it! The authors encourage us to get out those forgotten slow cookers, and to prepare mouth-watering meals, from stews and soups to desserts and less predictable recipes -- 800 in all! You can either follow by Networked Blogs or or click the "Follow" button farther down on the right hand side of the blog. Rules: One entry per person/household and you need to mention your favorite crockpot recipe. AND, if you comment about my giveaway on your blog, you receive an extra entry!! Just leave another comment letting me know. This giveaway is only open to those in the USA, ages 18+. All entries must be received by 11:59 Central Time on September 17, 2010. I will pick a winner and email them, and they have 48 hours to claim the prize. If no response, I'll pick a new winner! Have a Fantastic Friday Everyone!! We are still having lovely weather here in my part of Central IL, and I am trying to enjoy it before the predicted rain comes through tonite and tomorrow. I think I might just fall in love with this cookbook! Ohhhh I hope I win :) if not I'm buying a new cookbook! I love to cook in the crock pot. Mine broke and if I won it would force me to get a new one. And that would make me happy!! We love our crockpot! And that chicken and rice sounds delish! I'm trying to use my crockpot more. My favorite recipe is simple - just a simple corned beef with the season packet that cmes with it cooked on low all day. Then I add cabbage a hour before serving - right in the pot - it seasons it up and it's delicious. BTW - I actually have a beef roast in my crock pot right now! I need to use my Crockpot more than what I do. I would love to win Fix it & forget it Cookbook. My fav. crockpot recipe is my Chicken Cheesy Rice & Broccoli Casserole....or Food Network's Sandra Lee's Pear & Cherry Buckle.